HomeDog BehaviorDog Kisses Myths and Facts: Why Do Dogs Lick Your Face and Feet? All of us dog owners have heard it time and time again from those non dog owners “you let your dog lick you? that’s gross”. Most of us are not ashamed to admit it; it doesn’t bother us in the slightest. But why do dogs lick your face? 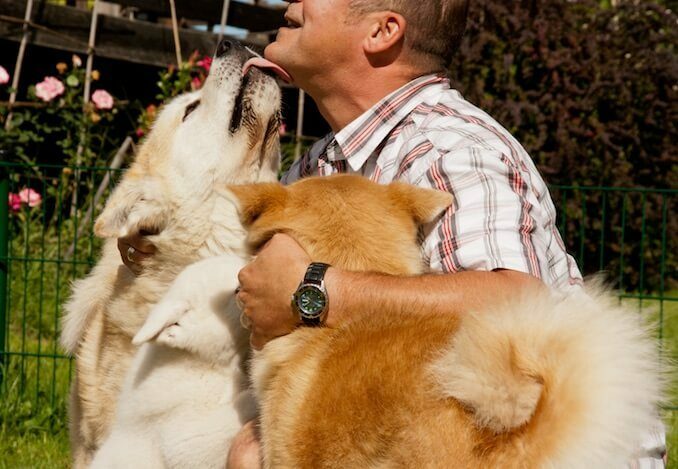 Do our dogs lick us as a sign of affection, as it’s commonly thought, or is there more to it? 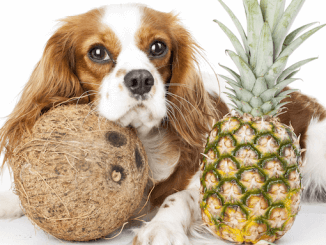 In this article we will explore why dogs lick certain parts of our body (e.g. face, feet and hands), whether we should let them, and ways to stop them if you have your boss coming over for dinner and slobber really shouldn’t be on the menu! Should You Let a Dog Lick You At All? It is impossible to know for certain why your dog will lick you. We are not mind readers, and dog’s can’t talk. However, we do have some pretty good ideas of how this behavior has developed and why they continue to do it. First lets go back to puppy hood. If you spend time watching puppies, you will notice that Mothers will spend a significant amount of time licking their young. This maternal behavior has been positively linked to later adaptive behaviors. In short, those puppies who are licked frequently when young are more resilient as they grow and less reactive to stress. It is believed that the act of licking reduces stress hormones within the body. 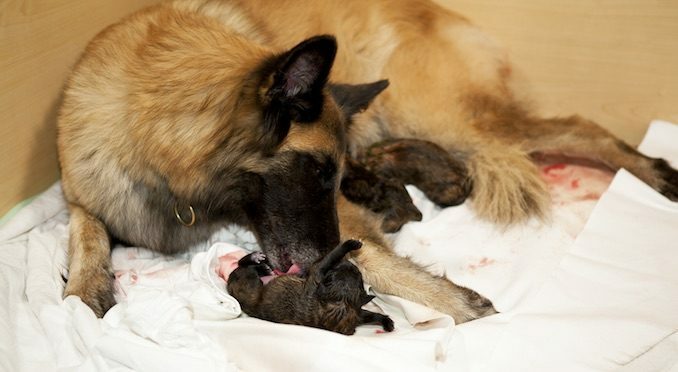 Poor maternal care has been associated with fearful dogs in their later years. It could be argued that dogs lick their owners to reduce stress levels. In a world that never seems to sleep, are our pooches in fact trying to help us feel better? To answer this, observe if your dog licks you more if you are feeling stressed. The other reason Mothers lick their young is to groom them and to keep them clean. Puppies learn how to groom themselves from their Mother. So, are our pooches keeping us clean? Generally when dogs are licking our feet, we tend to think it is because our feet are probably the smelliest part of our body. Scientifically, we’re not far wrong. There are more sweat glands on our feet, per inch, than anywhere else on our body! Like when dogs pant, primarily we sweat to release heat from our bodies. This is usually due to hot temperatures or exercise but it can also be as a stress response – when we are stressed, our heart rate increases, creating more heat within the body. However, we have also learned that sweating serves a purpose in maintaining the skin barrier and can also be indicative of further health conditions such as cystic fibrosis, thyroid issues, diabetes and tumors. We tend to think of sweat as being a salty water mixture, but in fact sweat is composed primarily of water, with ammonia, sodium, potassium, magnesium, chloride, nicotinic acid, creatinine, uric acid, ascorbic acid, thiamine and riboflavin. Dog’s don’t have an affinity for salt, but they do for water. Their olfactory system (sense of smell) is incredible. This is what they use to make sense of their world, a dog, on average, has 220 million olfactory receptors whereas humans only have 5 million. They are able to smell every molecule found in our sweat. So in fact, when they lick our feet they are gathering an astounding amount of information about us as dogs lick us as an exploratory behavior. This is often why dogs will sense we are sick before even we know we are. If they are gathering information, why does my dog lick my feet when I get out of the shower? As we mentioned earlier, dogs do have an affinity for water. So actually, when they lick your legs or feet when you have just gotten out of the shower – it may just be because you have water on your skin. As we mentioned, the dog’s olfactory system makes them sensitive to a range of scents. Even if you have wiped your mouth after eating, to the naked eye there is nothing left, to a dog, they will still smell that Philly cheese steak you had for lunch. 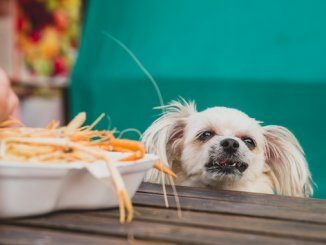 So you may notice that if your dog is one of the above breeds, they may lick your face more just because they are more sensitive to all that food you thought you had wiped away. So dogs lick us because they are attracted to food scraps and water – not so affectionate after all. We also have another explanation which throws the whole love idea out of the window. Dog’s lick us because we’ve taught them to. So you many not remember actively teaching your dog to lick you, but think about it; how do you respond when your dog licks you? Most of us laugh, smile, pet them or at least engage with them on some level. We know that dog’s learn through operant conditioning. If an action elicits a positive response or reinforcement it is more likely to be repeated. So, when our pooch licks us and we laugh, smile or provide some happy jovial response; they take it as a positive response (which it is) and repeat the behavior. Our dogs could be licking us because they think it’s what we want them to do. This also explains why dogs tend to kiss some people and not others. If someone responds in a positive way, the dog is more likely to repeat the behavior. If they kiss someone and they respond in a negative way – it’s unlikely the dog is going to do it again. Any dog owners will tell you, if you have grazed or cut yourself, your dog will start licking the wound. Most people would be put off, but there are actually some studies which suggest this is beneficial to healing. A researcher in the University of Amsterdam found that there are growth factors and histatins in saliva which contribute to wound closure. Histatins are antimicrobial and antifungal, therefore reducing the chance of infection. You could therefore argue that when dogs lick wounds they are in fact an antiseptic treatment. They also remove any debris from wounds with their tongue, again reducing the chance of infection. In evolutionary terms, this makes complete sense. That’s all dogs would have had – they wouldn’t have access to a first aid kit in the wild! This simple mechanism would have kept them alive. Should You Let a Dog Lick a Cut or Wound? Despite this warming idea that dogs can in fact help to heal wounds, it must be remembered that a plethora of bacteria has also been found in faithful Fido’s saliva. Some of this bacteria is zoonotic, meaning that it can pass disease from animal to human. Bacteria found in canine saliva has been linked to septicemia, which isn’t ideal if you are allowing your pooch to lick your wound. 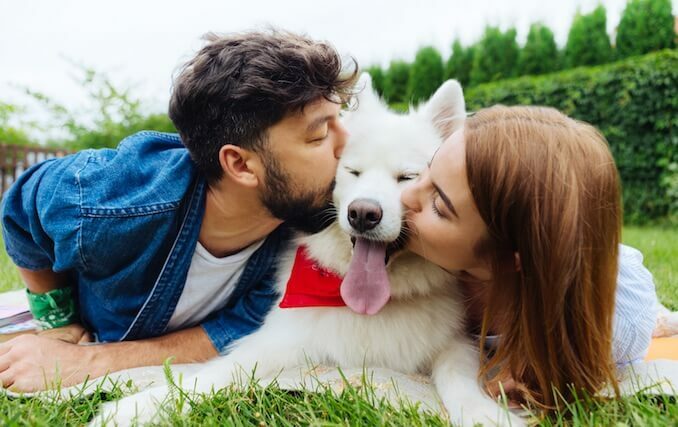 Most dog owners aren’t about to stop their dog from licking them – but it is necessary to point out that there are several strains of bacteria found in the mouths of dogs. Proteobacteria – these include the well known salmonella and helicobacter pathogens. Most people know the typical Salmonella poisoning symptoms: diarrhea, fever, abdominal cramps, and vomiting. Some people can have the helicopbacter bacteria in their digestive tract and not notice any symptoms for a number of years. Actinobacteria – this includes Streptomyces which are actually used to produce antibiotics and antifungals. Bacteroidetes – these pathogens are found in most anaerobic infections and have been known to be antibiotic resistant. Firmicutes – these include the sub classes Clostridia and Bacilli. Bacilli include a number of pathogenic bacteria. Fusobacteria – these bacterias have been known to cause periodontal disease, Lemierre’s Syndrome and skin ulcers. In short, by letting your dog lick you, they could pass on bacteria which could make you sick. How do you Stop Your Dog from Licking Your Feet, Face and Hands? 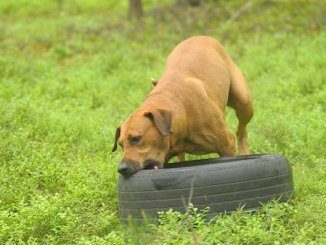 As we mentioned earlier, dogs learn through operant conditioning; which is helpful when training them. We can use this to our advantage when we are trying to teach our dog to stop unwanted behavior. If your dog starts licking your feet, ignore them. As we suggested above, a happy response could have inadvertently taught our pooch to do it. If he persists – distract him by throwing treats on the floor away from where your feet are or give him a chew. The important thing is he learns that licking doesn’t receive a response – he is then less likely to do it. Remember to avoid the use of punishment – we know that aversive methods can create problematic behaviors in dogs resulting out of fear and anxiety. So Should You Let a Dog Lick You? There is no denying there is a risk of your dog passing pathogenic bacteria to you if you let him kiss (lick) you. However, we have also established that there are beneficial properties in canine saliva which can act as an antimicrobial and antifungal. Saliva also contains growth factors which can support wound-closure. From their early days, puppies learned that their mother licking them made them calmer and reduced levels of stress hormones. 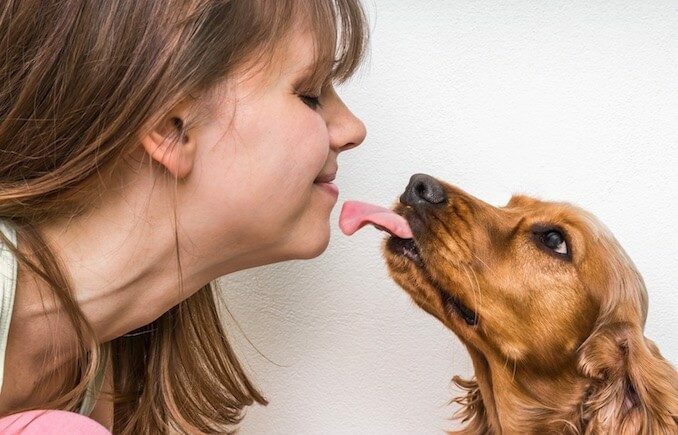 We could argue that when dogs lick us, they are also trying to reduce our stress levels. I guess you could say the jury is out on whether dog kisses are actually good or bad for you. However, if you decide that you no longer want your dog licking you we have a few handy pointers above. So perhaps dogs don’t kiss us as we thought. 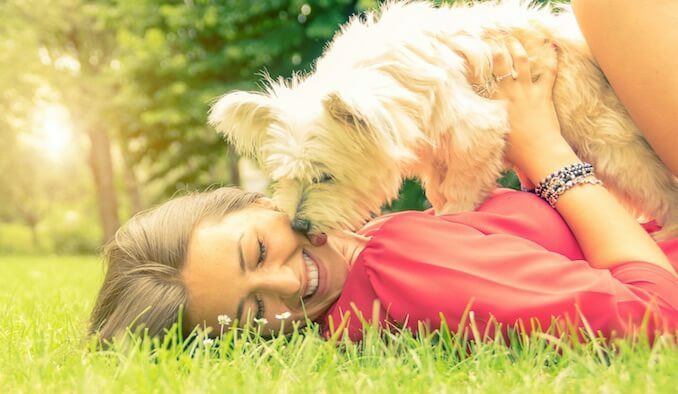 Although we could argue that dogs lick us to reduce our stress levels, as their Mother’s did for them, it is more likely that we have inadvertently taught our pooches that we like it when they kiss us, therefore they continue to do so. Dogs will lick your face, most likely because you have food scraps left over – unseen to the naked eye, but their incredible nose will sniff them out. You may feel that sloppy tongue just as you’ve stepped out of the shower – most likely just because you have water on your skin and dogs just like water. There’s no denying dogs will lick you to gather information, hence why they tend to lick the most sweaty parts of your body; hands and feet. It is information like this that often alerts them to our ill health even before we know anything about it. Studies have shown that saliva can be beneficial in wound healing and can act as a form of antiseptic. Yet it is also obvious there are many strains of pathogenic bacteria in saliva which can cause infection in humans. So will you continue to let your pooch kiss you?